In March, 2012, I headed to Kansai for a little trip. I visited Osaka to experience the food, but I also made an effort to go to Kobe so that I could enjoy one of my favourite pastimes, drinking. Kobe is well known for their sake breweries. It is the largest sake producing region in Japan with over one-third of Japan’s sake coming from Kobe. They also have a sake brewery tour where you can walk around and visit some of the famous breweries from Kobe. The sake area in Kobe is called Nada and it is basically a small industrial area located to the east of Kobe. It is a short 10 minute train from Kobe and 25 minutes from Osaka. It is probably one of the most accessible sake regions in Japan. Getting to the Nada Breweries region is really simple. Taking the Hanshin train from Kobe, go to Uozaki Station which is just one stop on the express trains. It is a relatively minor station with nothing very interesting around the station itself. 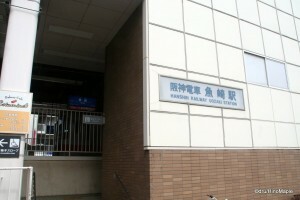 The entrance itself is generally deserted as well with nothing but a convenience store located on the south side of the station. I couldn’t imagine why anyone would want to visit Uozaki Station until I walked into the Nada Breweries area. The breweries in the Nada district are spread along the train line but Uozaki is the most eastern station for the official tour of the Nada Breweries district. To save on time and walking, heading south then west is the best route you can take to see all of the major factories that have their own museums and tasting rooms. Some of the breweries even have their own restaurants and the quality of the shop varies depending on how much money each brewery has. The chances of actually getting a look inside one of the breweries and seeing how sake is made are pretty slim. The brewing season generally starts at the end of October and lasts until the beginning of the New Year. It can be hard to visit these breweries at this time due to the cold, and in Nada, only one brewery actually has a tour where you can go and see the actual process in person. This doesn’t mean you shouldn’t go on a tour of the area as it is very interesting and enlightening. The first brewery I visited was Sakuramasamune. 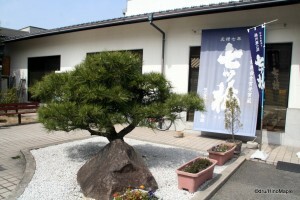 Sakuramasamune is actually a memorial museum that is also called Sakuraen. 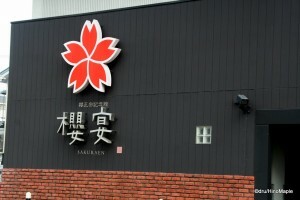 It is a brewery that promotes itself with sakura, cherry blossoms. When I visited this museum, it was very beautiful. The outside was very clean with black wood boards and wonderful art to promote the company’s logo. The inside of the museum was also equally as beautiful. There are two parts to the main building itself, the main floor and the upper floor. The upper floor houses a small museum with information on the tools used in the past to make sake as well as a collection of bottles of sake that were made during the years of production. For those who have an empty stomach, there is a restaurant located on the upper floor as well but I did not venture into it as I was just starting my tour. I spent most of my time on the main floor which includes a very small cafe, roughly 4 tables, and a small shop. The small shop had a variety of sake on sale with only a couple to taste. Since it was the start of my tour, I was pleasantly surprised when I was offered a taste of the sake. You may have to ask them to taste the sake but generally you can taste whatever they decide to make available. The museum was unfortunately poorly staffed so it was a little difficult to get any help. It may also have been due to the time as I was there somewhat early in the day before most people would consider going on a tour. The next brewery I visited was Hamafukutsuru. This is a small brewery, I think, that feels very much like a small brewery in Nada. It can be difficult to image but compared to Sakuraen, Hamafukutsuru felt simple and rural. The entrance to the brewery was more functional than beautiful. There were a few old sake barrels that were used to help brew huge vats of sake outside the main building along with tall stacks of plastic baskets used to transport bottles of sake. There was also the typical small pile of ceremonial sake baskets outside the entrance promoting the brewery itself. The building itself was a simple white building that didn’t appear to have much going for it. When I went inside, I felt as if I was in rural Japan. The building was very open and small towers of sake were present. I walked around a little before a very kind old man beckoned me over. I obliged and started to taste various sakes. I started to forget which one was which as I am not an expert but he was very good at pouring the different types of sake until I was happy. I had a chance to try various blended sake such as yuzu-sake and honey-sake. While I enjoy the fruitiness of the blended sake, I still prefer straight sake. There were so many to choose from and if you ask nicely, you can try each one at Hamafukutsuru. I asked for his recommendation and made my purchase based on his recommendation. One reason I enjoyed Hamafukutsuru the most is because it was a very friendly brewery that made me feel as if I was in rural Japan. The other reason is that most of the sake sold in the shop was local sake that you can’t find anywhere else in Japan. Kikumasamune is probably the most informational sake brewery in the Nada district. It is geared towards tourists as they even have a tour bus parking spot in front of the brewery itself. Kikumasamune rivals Sakuraen in terms of beauty but Sakuraen is small. 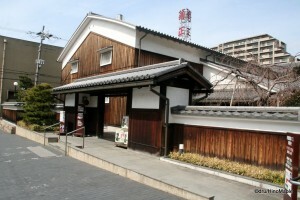 Kikumasamune is a medium sized brewery that billed its shop more as a museum rather than a brewery. 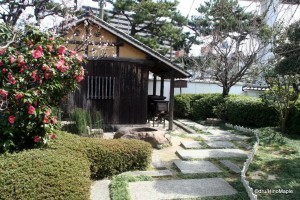 There is a small garden located inside Kikumasamune itself as well as a small video room. The video room is a medium sized room with nice wooden benches where you can watch how sake is made. The video is available in both Japanese and English. I am not too sure whether there are other languages available as I didn’t bother to watch the video. I already know the basic principles of making sake and I just wanted to find more sake to enjoy. 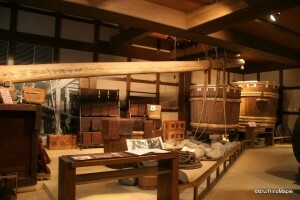 There is also a nice museum area where you can see life sized traditional wooden tools used to make sake. It is a little dark inside but the size of the various tools is amazing. I doubt they use the wooden tools anymore but it is a wonderful way to understand the process of making sake. Kikumasamune probably has the kindest staff in the entire region. I was delighted that they were serving all types of sake for visitors to try. They even had amazake, a type of sake that still has the rice mash included. It is a nice warm drink that is great on a cold winter’s day. I was even happier when I asked for a recommendation and they gave me a sample which was not on display. Sometimes the shops have sake available for tasting but you do have to ask for it. When I went to pay, the cashier even gave me several tasting cups. They were small and not really suitable for drinking sake everyday but it was more than enough for tasting sake. It was a pleasant surprise that was used very quickly that day. Sakuramasamune, Hamafukutsuru, and Kikumasamune are all located pretty close to each other. It is very easy to go from one to the other and they are all within close walking distance of Uozaki Station. Visiting these three breweries is all that is needed if you want a simple taste of what a sake brewery is like. If time is limited, you can visit these breweries within an hour and be on your way. However, if you want to enjoy sake and see more breweries, you must invest more time to see more things. The entire Nada Brewery tour is a long adventure that requires time and energy. You can always hop on and off the trains but it is much faster to walk from one brewery to the next. The people you will meet at each brewery have their own unique style and you may even find yourself going from brewery to brewery with the same tourists. It isn’t an easy task when the area is not geared towards foreign visitors but you can still get around relatively easily. This entry was posted in Kansai, Kansai Food and tagged amazake, Breweries, brewery, Hamafukutsuru, Hanshin, japan, Japanese sake, kansai, Kikumasamune, Kobe, museum, Nada, Nada Breweries, nihonshu, osaka, sake, sake brewery, Sakuraen, Sakuramasamune, tasting room, Uozaki, Uozaki Station by Dru. Bookmark the permalink. This was a very nice virtual tour. I started chuckling when I read this line: “I just wanted to find more sake to enjoy.” That’s a good approach to life in general! PS: Have you ever been to Yamanashi for a wine-tasting tour? Or is wine not your thing? Yes, finding more sake to enjoy is a good approach to life. I need to keep doing it. If you can recommend to us, which Nada brewery that produces the best sake? For me, I like Hamafukutsuru. Some people won’t like it, but it is all personal preference. In the same area, I also liked Kikumasamune. Really nice flavours there too. In the other area, the Shushinkan was really good. They have namazake which was really nice. At the far end, a bit far for most people to visit was Sawanotsuru. These are the breweries that I would visit again if I had a chance.